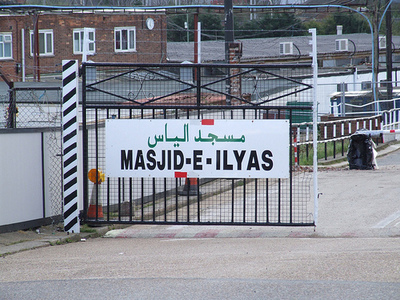 Gate to the TJ mega-mosque property at Abbey Mills, London. In 1996, British adherents of Tabligh i Jamaat [TJ], the Muslim preaching movement that reflects the fundamentalist Deobandi ideology of the Afghan and Pakistan Taliban, purchased a large tract of land in an industrial area of West Ham, in the London Borough of Newham. The property was formerly a chemical factory, but TJ proposed to erect a "mega-mosque" there, serving tens of thousands of worshippers, with extensive visitors' and conference centres, guest hostelries, a religious school, and parking space. Little attention was paid to the "mega-mosque" project until Londoners, both Muslim and non-Muslim, were disturbed to learn that, if realized, the TJ complex would appear adjacent to the new Stadium built for the 2012 Summer Olympics in London. The successful bid for London to host this year's Olympic Games came in 2005, almost a decade after TJ obtained the parcel on which it intended to place the "mega-mosque." The Stadium opened last month. The Games will commence on 27 July. Opposition to the "mega-mosque" has left its future unresolved. Community representatives opposed to the "mega-mosque" have demanded enforcement of an agreement between TJ and Newham Council, announced in February 2011, and calling for TJ to submit a valid planning application for the construction within one year. Absent such documentation, TJ was supposed to remove its temporary structures and car-park paving. The February 2012 deadline for a construction application passed without TJ's compliance. Having defaulted on that promise, TJ is left with a makeshift "Islamic" presence close to the Olympic Stadium. The organization held a public event in February at which it described its vision ambitiously, including a mosque eight stories high and apartment buildings of from four to seven stories each. Public-relations propaganda cannot, however, substitute for fulfillment of a solemn, legal commitment made to local authorities and disregarded. The TJ project has been renamed several times, having been described originally in promotional literature as the "London Markaz" ("Center" in Arabic). But while London already has a Central Mosque in Regents Park, financed mainly by Saudi Arabia, the London "mega-mosque" was designated as a hub for TJ activities in Europe. It has also been called the "Masjid-e-Ilyas," to honour, presumably, Ilyas Al-Kandhlawi (1885-1944), founder and first "ameer" or "commander" of TJ. More recently it was entitled the "Abbey Mills Mosque" after the industrial zone in which it was to be opened. It is now known as the "Riverine Centre," an innocuous name, and is listed in online mosque directories as the "Riverine Centre/Masjid-E-Ilyas/Markaz." Alan Craig, leader of the Christian Peoples' Alliance and a former Newham Council member, has been an outspoken and activist opponent of the "mega-mosque;" his views on it and TJ, however, are hardly anti-Muslim. Rather, Craig has questioned the character and intentions of TJ in terms shared by the overwhelming number of Muslim adversaries of Deobandi radicalism. Craig has described TJ correctly as "fundamentalist, separatist, sexist, and anti-social," and has warned that the "mega-mosque" would harm community relations and integration of Muslims in London. Muslims against the "mega-mosque" once included a group called "Sunni Friends of Newham," who warned that the TJ plan would discriminate against Muslims unaffiliated with the movement, alienate non-Muslims, and radicalize Muslim youth. The Muslim antagonists to the TJ campaign – knowing all too well the reality of Deobandi extremism in South Asia – collected 2,500 signatures on a petition against the "mega-mosque" but faded from the scene, apparently because of TJ pressure. MegaMosqueNoThanks, an organization led by Craig, has most recently called attention to TJ's failure to abide by its 2011 voluntary and binding undertaking made to Newham Council. To emphasize, TJ pledged to produce a valid planning application before February of this year. The movement did not carry out its agreed duties. Craig has said, "Not for the first time TJ has failed to keep an undertaking. The group has an history of breaking planning laws, flouting building regulations and breaching solemn agreements. Its track record is one of negligence and irresponsibility. We are urging Newham Council to move them off the site and to knock down the buildings." Craig and other non-Muslims challenging TJ and the "mega-mosque" should be supported by Muslims concerned about preventing alienation between non-Muslims and them. The continuing penetration of Deobandism is a problem everywhere South Asian Muslims are found. In Afghanistan and Pakistan the Deobandi-inspired Taliban wage open terrorism. India's Muslim minority of 160 million is divided as the Deobandis have seized positions in community institutions. Bangladesh is the scene of annual TJ assemblies drawing millions of participants. TJ and other Deobandi agents claim to have taken over a majority of UK mosques. In the U.S., the influence of Deobandism and of the Pakistani jihadist followers of Abu'l Ala Mawdudi (1903-79) predominates among South Asian Muslims, who account for a plurality of American Muslims. Marcia Hermansen of Loyola University in Chicago has written that followers of Barelvism --the majority trend among Muslims in the Indian subcontinent and the South Asian Sunni communities abroad -- have given up organizing a body to represent their interests in America. Barelvis are traditionalists opposed to Deobandism, and who support instead Sufi spirituality and who proclaim loyalty to non-Muslim authorities. According to Hermansen, their "failure may have occurred as a result of factors specific to the Muslim subculture in the United States, for example, the fact that most community organizations were already controlled by anti-Sufi Islamists" -- an assessment that is unfortunately accurate. Alan Craig and others drew a necessary line against TJ and Deobandi penetration of European Islam in denouncing the "mega-mosque." Their current demand is legally sound. The debris of the "mega-mosque" imposture should be cleared away from West Ham before the end of next month and the beginning of the Olympics. It is a blight on London, and on the standing of moderate, traditional, and conventional British Muslims.